“This was my only way to give back to my home country — taking care of our future leaders." This article is contributed by Operation Smile, a partner of Johnson & Johnson. When Dr. Emmanuella “Ella” Amoako earned her medical degree in Ukraine, she hadn’t sought to become a pediatrician. Rather, it was after she returned home to Ghana that pediatrics found her. New doctors in Ghana are required to complete a housemanship, a two-year period during which physicians train across the four specialties of medicine, surgery, obstetrics and gynecology, and pediatrics. “It was during my housemanship that I came to love pediatrics,” Ella said. “Ghana has a young population with very few doctors — much less pediatricians. 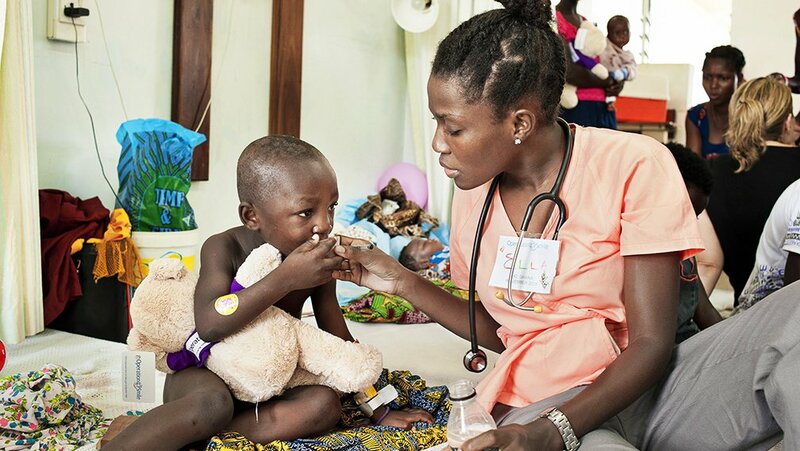 At just 28 years old, Ella has established herself as a young leader on the front line of Ghanaian pediatrics and shares a common commitment to ensuring that children born with cleft conditions have access to safe, effective and timely surgery with Operation Smile and its 29-year-long partner Johnson & Johnson. Like many low- and middle-income countries, Ghana suffers from a critical lack of healthcare infrastructure and capacity to provide basic surgical services to many of its citizens. This means people are often forced to live with surgically-correctable conditions like cleft lip and cleft palate — a gap in the mouth that didn't close during the early stages of pregnancy. It’s estimated that a child with a cleft is born every three minutes, or about one in 500-750 births. Depending on the type and severity, a cleft can create serious health issues if not corrected. Babies can have difficulty with feeding, which in Ghana often leads to malnutrition and starvation. People living with clefts suffer from debilitating bullying and social isolation. Ella’s fire to give back was lit when an Operation Smile medical mission came to her hospital during her pediatric housemanship. That’s when she met a Ghanaian Operation Smile medical volunteer who invited Ella to observe the mission. Witnessing the life-changing transformations changed her life as well. “I saw children who went into the theater and came back looking amazing in less than an hour,” Ella recalled. “I watched parents cry tears of joy with each child that came out of the theater. Today, Ella is a veteran of five Operation Smile medical missions and has started a charity that raises money to help Ghanaian children pay their hospital bills. She is also one of the leaders of Operation Smile Ghana’s nutrition program, which helps malnourished children gain enough weight to safely undergo anesthesia and receive cleft surgery. “As a doctor, I believe everyone should have access to good health and safe surgery,” said Ella, who plans to continue volunteering for Operation Smile and dreams of one day becoming a leader at the World Health Organization. Learn more about how you can join Johnson & Johnson and Global Citizen in moving the world forward.